Gearboxes : ZF 7550A with trolling valve. Two reverse osmosis fresh water makers (2x1500 gallon) 240 l/h each. 400/230 V/ 3 phase/50 Hz AC. 24 Volt system, DC, house, starting and emergency. One shore converter AC125-3/2- K/M5361 with dual shore cord 40 meter each. Foil-shape rudders with stainless stocks. Four capstans:(2) at midship,(2) at aft. Two hydraulic anchor windlass systems. Tender crane on centerline garage. Tender is stored in garage with room for additional water toys. Sandwich composite Hull, Decks, bulkheads and Superstructure. Lamination is a hand laminate with a 43-57 % resin to glass ratio. Core is vacuum bonded n place with corebond at 60 % vacuum. Reinforcement in bow, bottom of the keel and spray rail. Additional Kevlar reinforcement in way of propeller bracket. All through hulls openings below water are laminated during hull construction. Different Core make-up and densities are used according to Class and local load and temperature requirements. The use of peel ply was extensive throughout lamination procedure. All exterior surfaces have been post cured. Stainless steel used in the interior of the vessel is 304 or better. All stainless steel used on the exterior is 316 L or better. Core material is Linear Structural Foam (Corecell A, T and P). Corecell used for topside is the more heat resisting "P" core. Resin for general use is Hexion MGS 135 and MGS 235 High temperature resistant resin was used for the outer skin laminate from spray rail to sheer and inside the engine room. All exterior surfaces are post cured and painted with Acrylic urethane top coat with custom laminate fabricated print blocker for the topsides and superstructure. Fibers are Metyx in different woven compositions, longitudinally and diagonally for the general construction with Kevlar for local reinforcement. Some carbon was used in some of the deck detailing. Structural adhesive for bonding parts together is Gurit Spabond. Four integral storage tanks and one 4.000 Lt day tank will be integrated in the construction as double bottom tanks. All fuel tank are made with special Hexion resin, in accordance with classification requirements. All tanks provided with swash plates, properly stiffened, manholes, fill pipes, ventilation pipes, connection pipes to manifold, sounding system and stripping lines. Single integral double-bottom tank integrated in the construction as double bottom tanks provided with swash plates, manhole, ventilation pipes, connection pipes to water pressure system and sounding system. Tank interior is painted with special International paint. Two integral grey water tanks integrated in the construction as double bottom tanks one below crew quarters with pumping station to go overboard or combined with the 2nd grey water tank in engine room for treatment. Interior of the tank has special International paint treatment. Each tank has an ozone generator. Tanks are provided with manhole covers, ventilation pipes and sounding system. Ventilation pipes on these tanks will go up into the deck locker, where they are equipped with a small vent to prevent reversing and are led down to the boot-top. One integral black water holding tank integrated in the construction as double bottom tanks in engine room with a pump station below the crew quarters for forward toilets. The holding tanks could be emptied through Headhunter waste treatment system, overboard or deck pump out. Interior of the tank has special painted treatment. A tank flushing station is installed for cleaning. Tank is provided with manhole, ventilation pipes and sounding system. One integral clean oil tank integrated in the construction as double bottom tanks, installed in the engine room, tank top has manhole, vent and fill piping. Tank has a manual/electric pump out. The keel is first laminated completely, inner and outer skin and could be seen as a breakaway keel that would be lost due to accidental grounding the hull and integral tanks would still be intact. Outer and inner skin laminations are overlapping at the spray rail making outer spray rail laminate 4 times the hull laminate without core. Spray rail is then reinforced by high density core and finished at a 45 degree angle with additional laminate. This design element was chosen so that when dry docking the vessel it can be supported longitudinally on the keel and spray rail. Garage/transom door is FRP construction and has double acting hydraulic hinges, inflatable seal and six hydraulic operated locking pins. Garage floor is regarded as part of the weather deck and thus is sealed from the bilge below. All drains from the floor are separate and have their own bilge pump. Space in garage is suitable for one tender (approx. size 6m) and two jet skis (approx. size 3,15m). Tender and jet skis to be launched and recovered by means of a hydraulic boat crane. Two Maxwell VWC 11000 anchor-winches will be mounted on fore deck. The winches are of the vertical-shaft type and equipped with capstan head and will be operated by wireless remote control. The winches will have 5000kg line pull capacity and be certified by the Classification Society RINA. Two Maxwell VC 6000 vertical capstans, make are mounted on the aft deck. Deck switches operate the capstans. Aft deck capstans will have reversing motors and 2500 kg line pull capacity. Anchor winches and aft vertical capstans will be hydraulically driven. Anchor winch area and hull in way of anchor pocket is protected by stainless steel lining. Two Class certified 270kg galvanized Super High Holding Power (SHHP) Pool N anchors will be installed. Stainless steel plate welded on the lower part. Anchors to be stowed in stainless steel lined anchor pockets. Stainless steel bow-protection will be fitted. Two 110m lengths of 19mm diameter Grade U2 stud link anchor chain will be supplied according to the requirements of the Classification Society. Last link of chain will be fastened securely in the chain locker with an emergency release. Roller compressor with devil's claws for tightening the anchor will be installed. One 6 meter long elevating (20deg luffing) and rotating (90 deg slewing) telescopic passarelle, suitable for boarding with 75cm width when stern to quay. It will be driven by its own 3.5HP hydraulic power pack. It will have also float feature. One portable stair with handrails for quayside boarding port or starboard side. Boat crane in the garage will be Nautical Structure with central hydraulic interface. The crane will lenghten 1.4 meter on platform and have 2000 kg total lifting capacity. Rescue tender crane will be Nautical Structure NS and will be located port forward inside the deck locker. 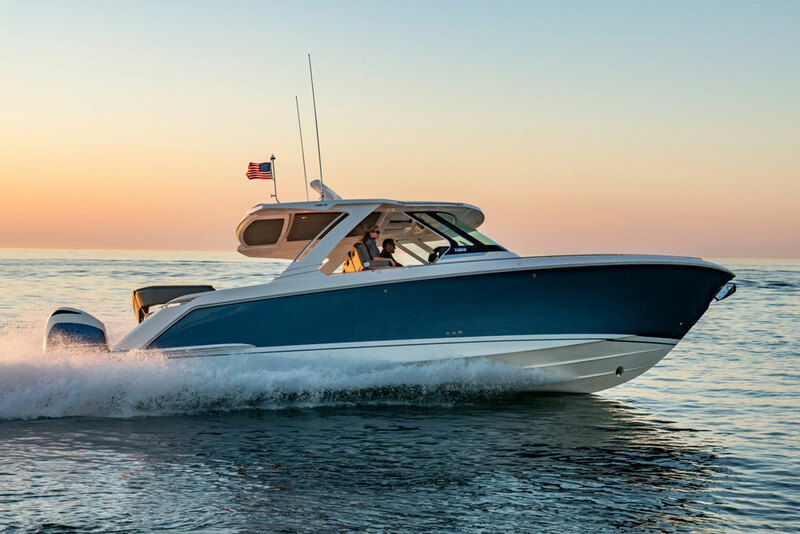 The twin M T U 16V4000 M 9 0 engines (3650 hp) will be electric starting, 24V DC. Engines to be equipped with fresh water-cooling, heat exchanger, seawater pump, oil cooler and oil drain pump. Main Engines will be mounted on resilient engine mounts on an FRP engine bed using steel inserts in the FRP engine girders. The ZF 7550A gearboxes with reduction ratio 2.9:1 will be rigid mounted on an FRP bed, using steel inserts in the FRP girders. The gaerbox mounts will be custom suspension Type RD 095. Propeller thrust will be absorbed by the build-in thrust bearing of the gearbox. For easy maneuvering the gearboxes will be equipped with trolling device. A PTO for the hydraulic pump driving the general hydraulic system will be provided on both gearboxes. Aquamet 23 propeller shafts with water lubricated bearings and rigid mounted gland. The shafts will be supported by a single leg shaft bracket made of CuNiAI. The shaft diameter will be 120mm. Two fixed pitch Rolla5 blade propellers with keyless connection will be chosen to get best performance with lowest vibration levels. Protective fin as part of the propeller strut is the lowest part of the vessel approx. 60mm below the propeller and keel. Main engines to be equipped with water-injected exhaust pipes through bottom near transom, by-pass in transom. Bypasses are equipped with separate water injection and electric operated valve to close the by-pass above a certain engine speed. Engine speed and switching treshold will be decided during sea trials. The exhaust system will be designed and supplied by De Angelo. Generator sets to be equipped with water-injected exhausts and mufflers. Discharge through ship's sides. Materials: Stainless steel AISI316L pipe and compensators. Propulsion engines will be controlled from wheelhouse and from the wing stations on starboard and portside bridge wings. Type of the engine controls will be M T U Bleu Vision. Hydraulic bow and stern thrusters will be supplied by TRAC. Twin counter-rotating 20" stern side thruster will be bolted on the transom. A 24" bow thruster installed in a tunnel that in its turn will be installed into a watertight compartment. The tunnels will be equipped with a protective grill. Operation by means of a joystick from main bridge and bridge wing panels. Hydraulic power will be taken from the general hydraulic system. The hydraulic motor will be fitted in the aft peak of the yacht. 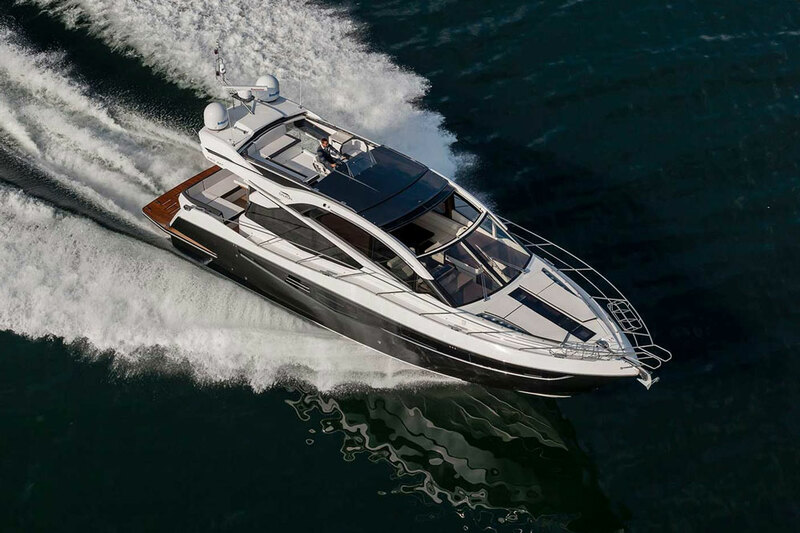 The yacht will be equipped with Trac 640 hydraulic active stabilizing system with non-retractable fins situated in forward area of the engine room. Stabilizer fins will be installed in water tight compertments. 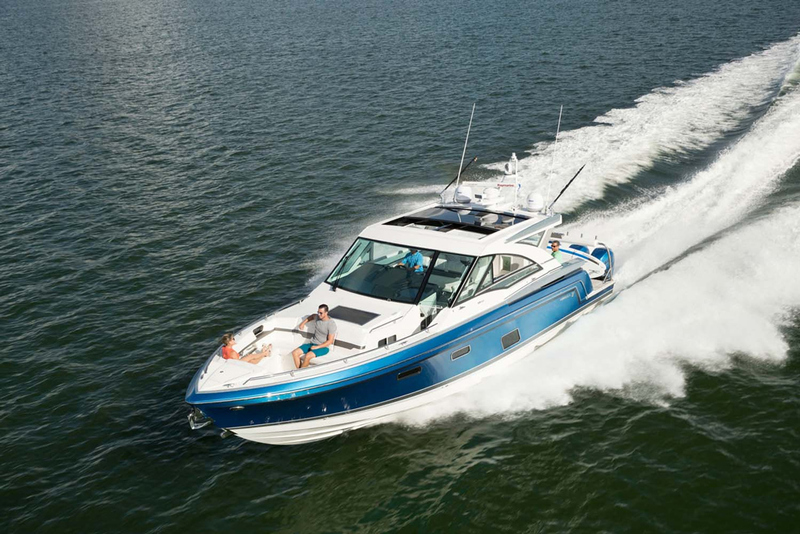 The system is designed by Trac for full stabilization at speed over 12 knots. Each fin has 3.85 area. 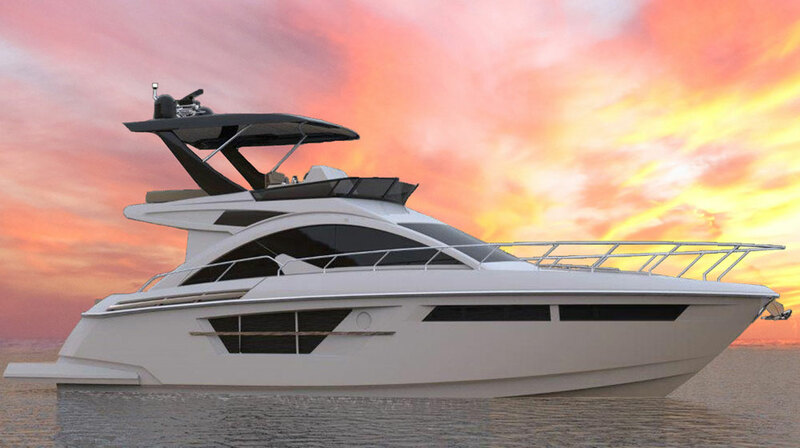 The system will also be equipped with a zero-speed mode for roll reduction while the yacht is at anchor. The electro-hydraulic steering system S2-29-2-35 will be supplied by Jastram engineering. In the control room there will be H58 manual emergency steering . The seperate hydraulic power unit will have 5 hp power with 75 liters resorvoir tank. There will be t w o S-400--12 steering cylinders and tillers. Rudders could be locked at centerline. Stainless steel rudders are designed and supplied by Amartech. Each rudder will have 1 sqm area. Two Northern Lights marine diesel generator sets will be provided. Each generator set will have 115 kW power at 50Hz and have sufficient power to run the ship's systems at 8 0 % of it's available electric power. Power is based on load-analyses of the ship's systems. These sets are equipped for automatic parallel running. Electric starting system 24Volt. Each set will have its o w n starting battery. Both generator sets will be installed above with water seperator exhaust system inside the ventilated sound shield. The engine of each generator set will have 6 in-line cylinders. Flexible mountings will be used. All pipe connections will be flexible. The fuel consumption of the generator engines is approx.11 GPH. The general hydraulic system is designed and supplied by TRAC. 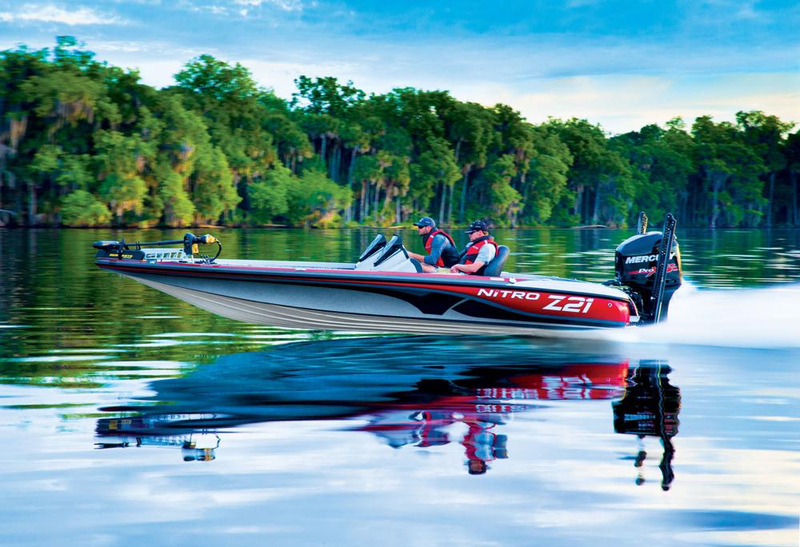 Total available hydraulic power exceeds 280 hp. System release pressure setting is at 3400 Pressure set at 2000 for deck winches and 1800 PSI for the stabilizers. System provides distributed fluid-power for a broad range of consumers. Four variable-displacement Rexroth hydraulic pumps connected to main-engine and reduction gear PTOs 190 CC and 71 Supplying the 24"bow, twin propeller stern thrusters, and the stabilizers (while navigating). The 75 Hp and 10 Hp flexible mounted powerpac can be utilized to augment the PTO pumps when maximum thruster performance is required during maneuvering. For operation when main engine power is not available there is an electro-hydraulic powerpac capable of running the Zero-Speed stabilizing system. All six pumps (PTO and electric motor-driven) are connected via a common system manifold. Any combination be enabled to supply hydraulic power to garage tender crane, transom door, rescue tender hatch and anchor windlasses (2), and capstans (2). A small stand-alone DC electric power pack operates the passerelle and swim ladder. One Headhunter Hydropaq HP/5 UV 40-230 dual pump electric hydrophore with FRP pressure tank for fresh water supply. Two filters will be installed, one for sand and sediment and one activated charcoal filter. Fresh water tank in double bottom, gauges as for fuel and low level alarm. Filling and ventilation lines to side decks. Filling station on SB side. For domestic hot water supply, three Gianneschi LT300 electric water heaters will be installed. Capacity will be 900 liters (240 gallons) total, based on standard operation of the yacht with a full complement of guests and crew. A ring line with a flow pump is arranged to secure instant hot water at each tap. Cold and hot water lines will be made of butylene. Cold and hot water lines will be well insulated. Dock connection for shore water supply on aft swimming platform, with pressure reducer. Outlets for washing deck and outside furniture will be provided. Position of outlets will be such that all areas can be reached with reasonable length of hose. One handheld shower with hot and cold water on swimming platform in a suitable place. Two Recovery Coral Sea Series 3" reverse osmosis fresh water makers will be provided. Each watermaker will have 10.600 liters ( 2800 gallon per day capacity. A suitable and oil water separator will be also provided for each unit. The execution and installation of the water makers will be in accordance with the applicable rules. The fire safety and lifesaving equipment shall be in accordance with the requirements of the classification society and MCA. (Machinery Spaces) 3M Novec 1230 fire extinguishing system shall be installed for the machinery space. An SOS locker shall be fitted near the entrance to the engine room. The locker shall be fitted with: SOS valve operation to close the fuel supply; Controls for closing fire flaps and shut down of ventilation systems; Controls for the fire fighting system of the machinery space; Storage for t w o Fire Buddy Complete ( firemen's outfit. (Galley) The galley hood shall be provided with a manual released 3M Novec 1230 fire extinguishing system. The system includes automatic shut-off of the galley hood and closing of a fire flap in the exhaust duct. The control shall be connected to the fire alarm system for information. 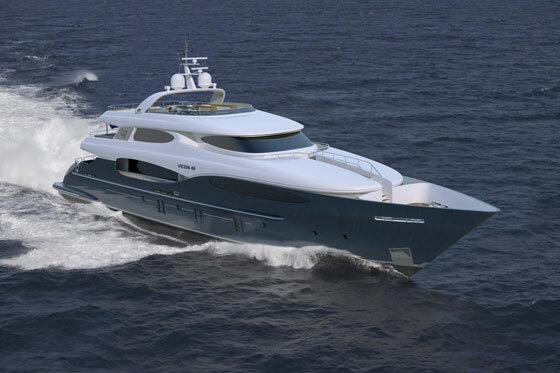 Sufficient fire hoses on reels and fire hydrants shall be installed throughout the Yacht. The reels shall be permanently connected to the fire mains and divided over all decks in order to cover all area's required within a reach of the fire hose. The fire hydrant on the outside decks shall be installed in recesses in the superstructure walls or bulwarks, where possible in combination with fresh water hydrants. Gianneschi ACM502 FiFi & Bilge sea water pump with 24m3/h capacity and diesel driven emergency fire/bilge pump will be provided. Four RFD Beauford Type MK10 automatic inflatable life rafts for 20 people shall be fitted, stowed in GRP containers. The rafts shall be located on one of the superstructure decks in FRP boxes integrated in the bulwark. The boxes shall be fitted with separate hatches for maintenance and access to the manual and hydrostatic releases. The storage arrangement for the life rafts shall include stainless steel telescopic life raft launchers to enable launching of each raft clear from the hull. Number of life raft and capacity is according to the requirements of classification and MCA.